Santo is in. Great decision, horrible timing. One of the greatest Cubs to put on the uniform earned his way into the Baseball Hall of Fame in the ’60s however it wasn’t until essentially 50 years later and one year past his dying day that the decision would be made to actually induct him as a member of the elite. An induction that is well deserved yet bittersweet in that Ron Santo will not be able to give his own induction speech next July 22nd in Cooperstown. The Golden Era Committee voted Santo into the Hall this past weekend, yet Santo is no longer here to enjoy it. He felt his numbers held up and even though the BBWAA voters didn’t agree, his peers and those who know the game best – from the inside – knew that Santo was worthy of their vote as no one knows what makes someone worthy of the Hall as former player. Those who look from the outside – from the stands, from the press box, from the owner’s office, from the office desk and from the newspaper stands – can only gauge so much as to what a lifetime in baseball and a career spanning 15 years worth of stats actually say about a player’s worth in making the club only the best in the game get to be a part of. Walk the halls at Cooperstown and you will only find ten third basemen representing the greatest at the position. Wade Boggs, George Brett, Mike Schmidt, George Kell, Eddie Mathews, Brooks Robinson, Freddie Lindstrom, Home Run Baker, Pie Traynor and Jimmy Collins signify what it is to be a Hall of Famer at the hot corner. Come July, Santo’s name and plaque will be added to the list and his journey home will be complete. Home is where you are accepted and feel you belong and the Hall was that for Santo. In his personal life, of course he had the love and support of his family through thick and thin, battling sickness and enjoying bright times when he was at his health’s peak. 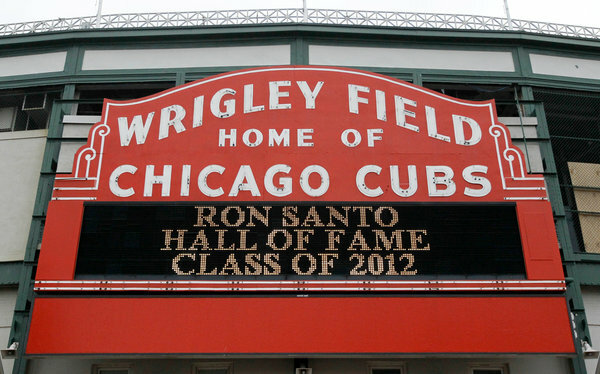 However, when it came to baseball, the Cubs and the Hall made up the home that Santo felt he belonged to. The Cubs have retired his number and added a statue of Santo outside of Wrigley Field. He is a Cub and always will be thought of as a Cub through and through. From the hot corner to the airwaves, Santo woke up a Cub, went to work a Cub and went to sleep a Cub. The Cubs embraced Santo just as fans did and the organization treated Santo with the same welcome arms that he deserved wanted and gave back to the organization. The Hall was another story. Santo never got closer than 43% of the BBWAA vote in his 15 years on the ballot. 75% is needed to be elected in by the writers. 14 of 15 major league seasons as a player were with the Cubs. While it is sad that Santo won’t get to address the world at the podium on the lawn in Cooperstown while receiving the much deserved applause his career and the way he handled himself during that time frame while battling disease and working with medication that worked nowhere near as well as it does nowadays and often without people even understanding that he was battling it at the time, earned him – for me, I can appreciate the fact that it is the Golden Era committe that has accepted him in and welcomed him home. I respect baseball writers for their knowledge of the game and their right to voice their opinion on such things as who is Hall-worthy. However, even the greatest group of baseball writers who are surrounded by the game day in and day out can get it wrong at times. Santo was one of the ones the BBWAA got wrong. To be around the game and surrounded by the game every day is one thing. To be a part of that game is another story. The Golden Era committee is made up of some of the greatest to make the game what it is today. They know what makes an average player, a good player, a great player and a Hall of Fame worthy player. It may have come a year too late, but finally a group with a say got it right. The Golden Era committee knows best and are appropriately the ones to do the right thing and welcome Santo at home. Congratulations, Ron. Looking forward to being there for your day in July. Go Cubs Go!